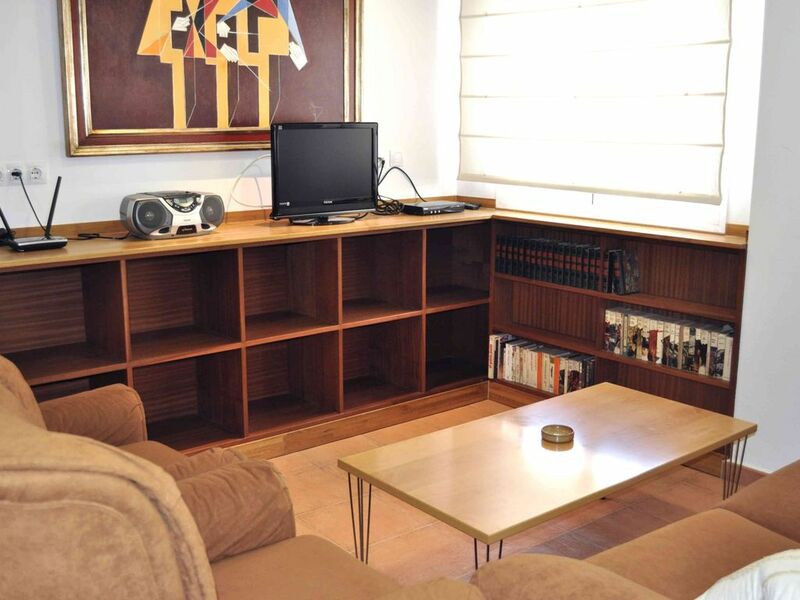 3 bedroom apartment for 6 people next to the Church of San Luis. The apartment is a duplex / penthouse very bright and has a sun terrace for private use. It has a spacious living room, bedroom with double bed, and two double bedrooms, kitchen and two bathrooms. It is perfectly equipped to enjoy during their stay accommodation. It features air conditioning and heating, hot water, TV and wifi Internet 24 hours. The kitchen has a large fridge-freezer, hob, oven and microwave oven with grill, small appliances like coffee maker, blender, juicer. Environment: It is located next to the Church of San Luigi dei Francesi, jewel of Sevillian Baroque. And nearby are the churches of San Marcos, Santa Marina and the Basilica of La Macarena. Access by car is comfortable, because the street San Luis is one of the main access roads to the center. C5 bus line runs along the building, and within walking distance are the stops of the main lines. Nearby, you will find bars and restaurants of all styles, from the most modern to more traditional Sevillian cuisine. Perfect combination - a modern apartment in the atmospheric old part of town. Only 20 minutes' walk to the Cathedral, plenty of interesting things to see nearby, but because it's in a residential area, the streets around the apartment were quiet. Close to the Alameda de Hercules where there are great restaurants. Some good supermarkets within a few minutes' walk, including Carrefour where you can get fresh milk and English Breakfast Tea, which is important for us Brits :-) The apartment was comfortable, practical and clean. Our host was helpful and easy to deal with. Muchas gracias por su comentario y por confiar en nosotros en su visita a Sevilla. Esperamos que hayan disfrutado y hayan estado cómodos en el apartamento. Freundliche und hilfsbereite Vermieter, schöne Wohung, tolle Dachterasse! Super! Ha sido un placer que se alojaran con nosotros, esperamos que hayan estado cómodos en el apartamento y que hayan disfrutado de su visita a Sevilla. It is next to the Church of San Luigi dei Francesi, jewel of Sevillian Baroque. And nearby are the churches of San Marcos, Santa Marina and the Basilica of La Macarena. Access by car is comfortable, because the street San Luis is one of the main access roads to the center. C5 bus line runs along the building, and within walking distance are the stops of the main lines. Tarifas: La tarifa base de este apartamento es para 4 personas. Llevará un coste extra de 15 euros por cada persona extra. Fianza: Durante la llegada se le solicitará una fianza retornable de 150€. Está podrá abonarse en efectivo, o facilitando los datos de una tarjeta de crédito (el cargo no se hará efectivo si no se observan desperfectos durante la salida). Horarios de entrada y salida. El horario normal para efectuar la entrada al apartamento (check in) es de 16 h a 22 h. A partir de las 22 h y hasta las 24 h, se aplicará un suplemento de 25€ (después de las 24 h consultar). También puede consultar la posibilidad de entrar antes de las 16 h. La salida de los apartamentos (check out) debe realizarla antes de las 11h. Infórmenos a su llegada si requiere una hora posterior de salida, haremos todo lo posible para complacerle y le indicaremos el coste adicional en su caso.